xmas wrap up. good things. lauren posted that seoul, the korean guy gene lee (i had also heard jin lee) who would always be dancing at the milwaukee/damen intersection and bringing a smile to most everyone's face passed away. it's really too bad because he really was adored by a lot of people. i have a bunch of acquaintances who knew him. it seems from the post by his parents that he might have killed himself. really sad. his music is really really good. i had a really great christmas back home. my parents surprised both my brother and myself with a gps system. it's something i never would have bought myself in a million years, but i'm actually really pleased with it. okay, i admit that my first thought was "can i return this? ", but after playing around and realizing just how cool it was, i was hooked. i used it to navigate to carol bui's house after we saw sweeney todd at shirlington. i was waiting for alex to call me back but he never did because he lost his phone at home. i used the gps to get from carol's place to his place so i could leave it there for him. stephanie had sent me this awesome matt cipov print and i went with erica to jo-ann's to get a frame for it and the storytime print. actually, i thought i'd be able to find a frame for the jessica gonacha print that we had traded for (along with an awesome print on woodblock), but i couldn't find anything suitable. the print itself showed up with a corner crumped. cursed usps. also they bent the cipov print in half too, but it looks good anyways. i can't wait to put this stuff up, but i don't have any appropriate nails. last night i met ginny, mollymintyfresh, lcb, and meredith at PANIC. that was fun times. me and a bunch of dudes did drunky brunch at joey's this morning. no, really. i was the only girl. thanks for bailing, ladies! zachary, sei-jin, marty, gavin, and his friend from l.a. sausage party! jake, katie, bob, and what i guess is the new threadless crew showed up and were at the table next to us. then afterwards, z, s, and i saw the orphanage at landmark. it was good once, but i don't think i'd need to see it again. then we came back, changed into footie pajamas, ate ice cream, and watched the new luc besson, angel-a. i liked it. the end was pretty cheesy, but cheesy is good. seriously, at least the last couple hours, i have been reading lj friends entries and catching up. i think i am finally hungry again. leftovers from the painted lady organic eatery or butterfly...hmm! whoo hoo, my so-called life box set!! that was my xmas gift from joe. as soon as i started the first disc i was instantly taken back to watching it on tv and hit with so many memories. man, i love that show! i have a similar vinyl wallet made by queen bee creations, and i loooove it. just a plug for awesomeness that has stood up to a lot of wear. DOH. You know, now that I think about it, I definitely saw LCB because I see her at every Panic, although I've only talked to her like once ever. And I thought "hmm, wonder if Leigh's here?" And you were! Oh vell. Filipino food next weekend? Or whatever? Bars post-smoking ban yay! matt and i were looking at those pez dispensers at border's yesterday and cracking up at the monkey one. whoa yeah it looks like dr. zaius. oh well. 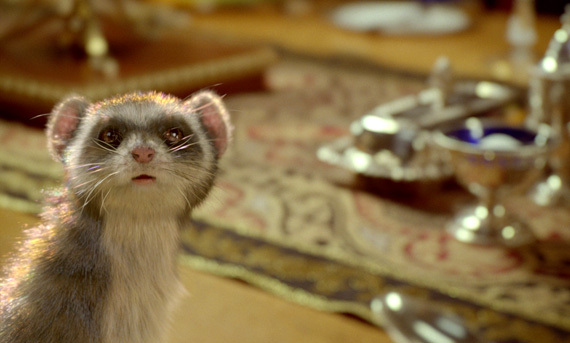 the ermine one of pantalaimon i got was cute. 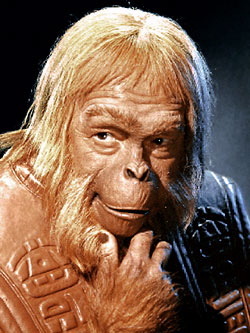 dr. zaius is from planet of the apes, dude.